You can control these awesome Air Swimmers using the remote control, watch as the Air Swimmers Flying Bass, Air Swimmers Shark and Air Swimmers Clown fish glide effortlessly through the sky. You can see where they get their name as they literally fly through the air in such a serene manner it is quite beautiful to watch. In fact, the swimming motion bears an uncanny resemblance to their water-borne counterparts, it seems so effortless and serene, all you have to do is point them in the right direction and watch those Air Swimmers swim high in the air! Air Swimmers are almost ready to fly straight out of the pack, all you need to do is get hold of some helium. You can either purchase your Air swimmer helium form our website to be shipped together with your Air swimmer with discounted price or your nearest party store, florist store or grocery store. BEWARE OF THE KNOCKOFFS! . We sell only the REAL ORIGINAL PRODUCT from the distributor. Generic Air Swimmers are low quality and the remote controls do NOT work as well. The remote control allows for 360 degree turning control. 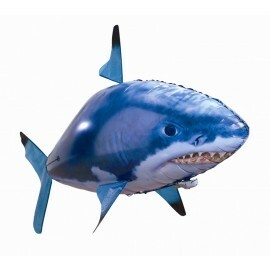 The Air Swimmers shark or clown fish measure 56" x 36" and is made from a high quality, durable nylon material. The body will stay inflated for weeks and can be filled again and again. The remote control and body require four AAA batteries .